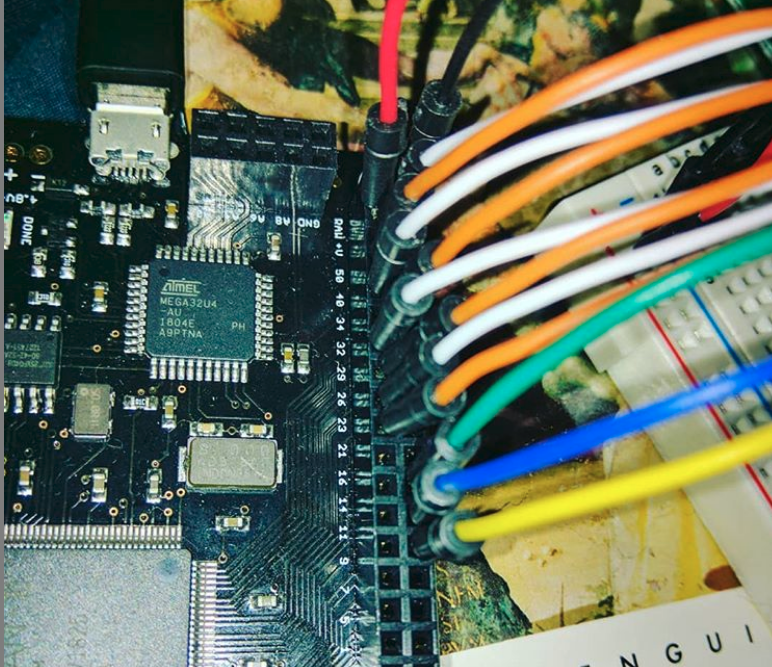 Wiring my board up to an LCD screen on top of a copy of Hegel's Aesthetics. Hi folks, in this post I'm going to give you as gentle and introduction to FPGA (I will unpack the acronym later) programming as possible, hopefully explaining as much as I know (which is a very little up to this point, but enough to I guess help some folks so), while providing lots of examples and challenges for folks who need ideas to try out that are easy enough to get a foothold. To start lets think about what we are going to do here, FPGAs are pieces of hardware that we can configure. That configuration is done by taking the language we speak (which is English/Human-Language equivalent Verilog); and converting it, into that configuration for the FPGA, this is configuration is called a bit stream. A bit stream is what the final effort of "synthesizing" is essentially; its kind of like putting together a little song for the chip that the computer tweets over lovingly, lullying it into total subservience. There are many different kind so FPGAs so you can play little songs to many different kinds of chips, the tunes are ever wilder, faster and more exciting the more powerful the chips get - I've only programmed like one so far. But have a shop around, there are tons of boards and kits out there that aren't that expensive, some of them are open source as well! I'm going to use the Mojo v3 in this post though (purely because its a well documented board, there's a book out on it as well); i thought it would be an easy way to start. I will definitely cover more open source FPGA tech as well in future :P.
FPGAs (Field Programmable Gate Arrays - see told'cha) are essentially a very very small grid of (usually thousands) of configurable circuits. FPGAs provide a way to describe combinations of these small configurable circuits that are provably analogous (intended to work exactly the same as) some hardware description language. To configure the circuitry I mentioned, you essentially tell the FPGA what to tell its different components. 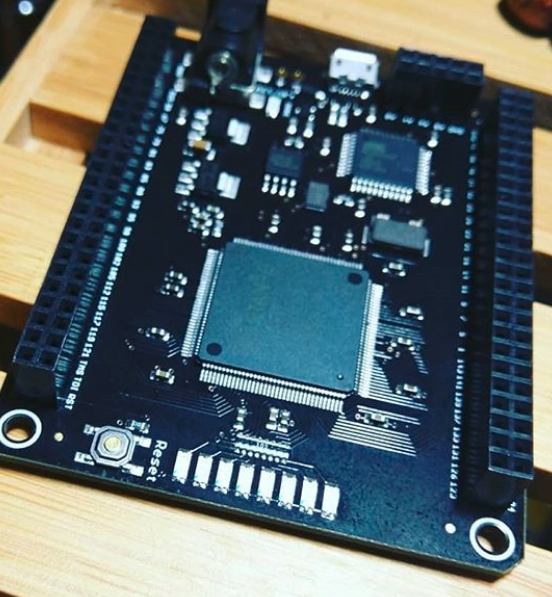 This list might be a ton of information but its not super crucial you understand it, you can program a board fine without knowing any of this, its just good to know about it so you can be a little more aware of what you're doing. Programmable Interconnects (Points) (PIPs) : These are (according to my sources ) basically blocks of circuitry that allow you to route signals between CLBs. Flip Flops : these are for responding to clocked events, storing data (I will explain how this happens later). You will essentially orientate your programming to leverage these Flip Flops to modify information in response to clock events (when the clock signal goes from high to low or vice versa). This I think why they are called" flip flops" because they allow you to flip flop along with the clock lol. Internal RAM: for configuring Look up tables (LUTs), these are basically just switch statements of a certain kind, they hold configurations for the logic components inside the CLB. Configurable I/O Blocks (IO Blocks) : These are basically input/output points (or if you like ports), that allow you to tap signals into the FPGA, or push out signals from the FPGA. A simple example would be turning on an LED, you will need some place to stick the LED 'into' to make it turn on, the I/O block is where this signal for the LED will get fed from. Please don't stick LEDs directly into your I/O ports on your boards I'm just making an analogy - I will most likely cover a simple external LED tutorial as well, because its pretty vital in the journey to more complex external stuff ;). The I/O blocks have components to them as well, these essentially allow you to respond to the signal when it makes a certain transition or takes a certain state. The high or low state of the signal is called the logic level. If we tell a circuit to respond to an event when an input signal is high, the input is referred to as active high. When we tell it to respond to an input signal is low, guess what its called active low! Check out  in the Reading and References section for cool pictures about it. Anyway its basically like play dough for hackers and electrical engineers. They aren't hard to get your head around but the can be very very useful when you do! I think getting over the FPGA hill is a very important step in your career as a hacker (just my opinion lets say). DISCLAIMER: The current tutorial involves giving your address to the Xilinx folks (I think this is because of US Export laws) which is pretty crappy not for any other reason than its private information and it can be mistreated, lost or stolen. So if you're not up for that, please just follow along for interests sake I promise I will provide fully open source no address information bribery required - tutorials as well. But, if you're okay with the Xilinx folks knowing where you live and that you're learning the dangerous sorcery of FPGA hardware - please go download the Xilinx ISE below. Mojo V3 Board available at amazon, SparkFun, Alchitry  and I'm sure a ton of other places. You will need to install the ISE on which ever platform you like (I suggest using Linux based one's its just way easier and doesn't require a ton of driver drama). For more information how to get that going please see the following example: https://alchitry.com/pages/installing-ise . I'm going to be doing this tutorial in Verilog; realizing this can be a bit of an obscure language (I agree it is obscure - but for no super hard to understand reason to be honest) you might need a bit of a jump start into to it if you've not ever done it before, but don't fret the whole point of this blog post is to try to explain this to someone who's never done it before. Lets get to it, Verilog is a hardware description language, we call Verilog hardware language register-transfer-level (or its an RTL language); this wording is meant to describe what Verilog targets with its abstraction, essentially the transfer of signals between hardware level registers (and other components) [11,12,13,14]. Anyway once you have everything installed according to the tutorials above; you can then start scripting some Verilog for the Mojo. This is just an example Verilog script to show how elements of the language work, it probably won't achieve anything profound if it were implemented as a real Verilog module on an actual FPGA though (this is because of the frequency of the clock - more on this later). And the reason is something that I need to cover before I can show you a real Verilog script. Anyway, before we unpack that; lets take a look at this script and explain each part. This is the module header; it declares the inputs and outputs of the module begin defined here. Also it obviously needs to have a declared endmodule as well. These inputs and outputs (and I'm no deep expert here) can essentially be driven by the I/O blocks - depending on what you feed the module as inputs. So if you want to drive in some external module with pins the FPGA board needs to talk to (like a logic analyzer or oscilloscope) - these input / output declarations are what you designate them as. This is an always section of Verilog code, it defines actions that happen "in tune" or according to certain changes with the specified sensitivity list in the brackets. This means that when the clock "clk" (which is for all intents and purposes a square wave - see the example further down), is registering a change from a 0 to 1 value this is called a positive edge, or posegde in Verilog (the other one is called a negedge or negative edge). So it essentially says in summary, when the clock changes from 0 to 1 always do this stuff. And it closes with an end token of course. This is called a non-blocking assignment. This kind of assignment means if there are any assignments after it or before it (of this same kind "<="), they will all be assigned in parallel (see  for an excellent explanation of the different pit falls and always block politics as well). Its kind of like attaching connectors to things from a source, if they are in parallel the electricity can be expected to be seen running down each connector at the same time. The assignment gives external_led the value of clk xor'd with the current value of external led. If you think it through, you'll see that this is a way to make it flip on and off not so? A good exercise is to try and write out the values. These always blocks, are for designing combinatorial logic circuits or logic gates (literally AND, OR, XOR etc gates ) they are great if you need to get really really low level, as in as base implementation of any digital logic as you'd like on the FPGA. blocking = assignments are for combinatorial logic : Logic gates, where all statements take on their respective actions in parallel to each other. non-blocking <= for sequential logic : statements potentially depend on a certain sequence to derive their values. Anyway what I'm trying to say is blocking always blocks are for combinatorial logic, non-blocking always blocks are for sequential logic or building registers - these are things that store information for us, we can chain them up in "sequences" and do useful things like building finite state machines! The reason I'm going with a non-block always block in the example, and will most probably go with it in the real example too - is because the on board led's on the Mojo are declared as reg's in Verilog- and we will modulate our clock speed using regs too! You will run into a fair amount of frustration with this concept anyway - so just get used to wading out your problems with it, I don't think its a completely avoidable mistake hehe. You probably want to pick up a book on assignment operations, and constraints and practice them a bit (I've tried to be as verbose as possible). This is because one can immediately tell that this imposes major drama on which types are assignable to which types i.e. can you assign reg to wire? Its basically due to how it resolves different types to the board components and combinations of them mentioned above - if you give it something that works sequentially or is meant for non-storage options it can cause antagonisms that are annoying. So be careful and try out stuff a lot, write some bad Verilog so you know what it looks like lol. Okay so that's pretty bare bones Verilog, you will probably be able to develop "valid" Verilog using this but to be able to compute on real things, real clocks and achieve actual interaction with real "hardware" you're going to need to learn how to divide the clock! reg [25:0] clk_div; //declare 25 bits worth of D-FlipFlop "storage"
assign led[6:0] = 6'bz; //set the LEDs from 6 down to 7 to "off"
input clk - the input clock signal (pay attention to the User Constraints File to see how this is declared). In our example it simply a slowed down version of the clock on the board. input rst_n - we don't actually use this just yet, its the input from the reset button on the Mojov3 Board; this is a great little "toggle" to have around. "The net data types can represent physical connections between structural entities, such as gates. A net shall not store a value (except for the trireg net). Instead, its value shall be determined by the values of its drivers, such as a continuous assignment or a gate." This adds 1 bit to the 25 bit value of clk_div. As far as I understand this, it means that clk_div will add up and when whatever number its at has a "1" in the 20th bit position, the LED will turn on. If you think about how binary numbers add up you can see that this means it will slowly bubble up the bit values, floating the carry up the 25 bit places until it hits the 20th one. This is much slower than the raw clock, which flips up n down at 50Mhz which is like a bajillion times a second your eyes won't even see the LED move its so fast. So we basically tell the clock to add up its flips in a total and when we are happy with the amount we tell the LED to turn on! I hope that makes it easier to understand! What this means is obviously we can control how fast the LED appears to pulse, we can make it pules faster and slower, we can even make multiple LEDs on the board pulse at different rates if you want to give yourself a tension head ache lol but its fun! It can be abit hard to get examples If you understand how the clk_div trick works then you essentially know how to build a counter already. All you need to do is make a counter for the led's. But there's one caveat, and that is again the issue of blinking the LED on and off too fast. To solve this we just divide the clock, and then add only when the clk_div reads a 1. If we then map the counter to the LEDs, jobs done! In this example I also made them add at different speeds you can of course make them all tick the same way but that would be kind of lame. Anyway that's it for this one, let me know if I got some stuff wrong, I'm going to keep posting about other boards n blinky lights. Stay tuned!